The purpose of this article is to explain sealcoatings; their relevance for the protection and preservation of asphalt surfaces, composition, application and other pertinent details to derive optimum performance from such coatings. Sealcoatings are specialty water-based coatings, based on refined coal tar or asphalt, rubber and specialty additives, that serve as 'barrier coats' to shield asphalt by deflecting the destructive elements of weather and chemicals, thus protecting and preserving the pavement. 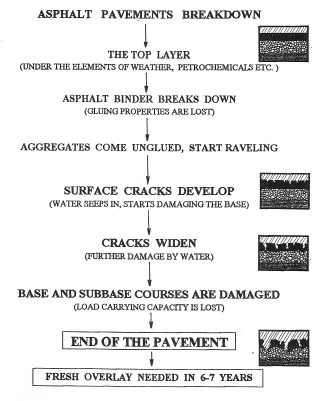 Let us pause here at this point and review some of the basics about asphalt pavements and why they have to be protected. What factors cause them to deteriorate? After all we are talking about a major investment (in asphalt pavement), which has to be preserved and kept in good service condition. Roads and pavements are constructed with multiple layers of aggregates like limestone, clay etc. of varying shapes and sizes. The larger aggregates are used for the base and smaller aggregates for the sub-base courses. The depth of the base and sub-base courses and the type of aggregates used are selected according to the load bearing requirements of the roads and other pavements. The aggregates used in paving have a strong affinity for water and swell to many times their own volume when penetrated by water. The obvious step, therefore, is to keep the water from approaching the aggregates in the base and sub-base, if the road has to be kept in service for any length of time. This is accomplished by placing a mixture of fine aggregates and hot Asphalt Cement (AC), as the top course for the pavements, therefore, the top course may be considered the “roof” of the pavement. Why Asphalt; because asphalt is known as one of the best waterproofing materials and has been used since the 18th century for road construction. Additionally, it has excellent gluing (or cementing) properties for aggregates. The top course repels water and keeps the underlying base and sub-base dry and dimensionally stable. Despite its redeeming values as a paving material, there is one major drawback. Asphalt has very poor resistance to weathering and is easily attacked by chemicals, gasoline, oils, fats and deicing salts. The poor resistance to petroleum products is quite understandable from the fact that Asphalt is the by-product of petroleum refining process where the lighter fractions, gases, gasoline, solvents, oils etc. are selectively distilled off, leaving behind the highest boiling fraction-Asphalt. Remember, these products existed together in nature for millions of years as crude petroleum. Understandably, they have natural mutual affinity and once brought back in contact; they readily assimilate and dissolve into each other. That is why Asphalt is easily dissolved or attacked by petrochemicals, gasoline, oils, fats etc. Where do the poor weathering properties come from and why does asphalt deteriorate under the ultraviolet rays from the sun? Asphalt is a very complex mixture of thousands of chemicals. A good proportion of asphalt chemicals are open chain compounds (aliphatic), which have sufficient degree of instability (instauration) in their molecular structure. When attacked by the highly energetic ultraviolet rays, the chains or bonds between the carbon atoms in these compounds are severed, thus producing compounds with different molecular structure, which do not have any of the original properties of asphalt. It is not an exaggeration to say that asphalt begins to deteriorate from the moment it is laid down. The elements of weather degrade the asphaltic oils from the surface and chemicals dissolve them away. With the loss of asphalt cement, the aggregates in the top layer (roof of the pavement) begin raveling and develop the first sign of pavement deterioration; the appearance of minor surface cracks. As time progresses, cracks increase in number and size. If not repaired well in time, such cracks, allow water to penetrate sub-base and base layers. Saturated with water, the aggregate in the base and sub-base swell, expand and create larger cracks, thus allowing more water to destroy the pavement. This cycle is self-perpetuating, resulting into larger cracks, pot holes and other distresses. The problem is further exaggerated by the freeze thaw cycles. The protection of asphalt is more critical for those pavements that do not get the benefit of steady rolling traffic like roads and highways do. The rolling traffic continually kneads the deteriorated asphalt from the very top layer back into the deeper layers thus exposing fresh asphalt layers. With time and usage, all the asphalt is eventually degraded and the road sections are either capped with a new course are replaced with a new asphalt cement/aggregate top course. The situation with pavements that do not get much rolling traffic: parking lots, driveways, airport aprons etc., is quite different. In the absence of steady rolling traffic, the asphalt from the top layers keeps on degrading without the benefit of the newer layers coming up. These pavements are prime candidates for protection. And that is where sealcoating comes to the rescue. Read part 2 of this series here. Basic Concepts of Refined Coal Tar Based Sealcoatings, Part 2. You can also visit the Star Seal website to learn more at http://www.starseal.com.